CORONELLI -Chnin/Fortezza nella Dalmatia. Conqustata alla SS. Republica di Venetia. Dall eccellenza del sig. Cau: proc: Girolamo Corner/Generale De Dalmatia et Albania etc: Dedicata/ All’ Illustrissimo Sig: Catarino Primogenita Suo. CORONELLI, V. - Chnin/Fortezza nella Dalmatia. Conqustata alla SS. Republica di Venetia. Dall eccellenza del sig. Cau: proc: Girolamo Corner/Generale De Dalmatia et Albania etc: Dedicata/ All’ Illustrissimo Sig: Catarino Primogenita Suo. Chnin/Fortezza nella Dalmatia. Conqustata alla SS. Republica di Venetia. Dall eccellenza del sig. Cau: proc: Girolamo Corner/Generale De Dalmatia et Albania etc: Dedicata/ All’ Illustrissimo Sig: Catarino Primogenita Suo. - CORONELLI, V.
Title : Chnin/Fortezza nella Dalmatia. Conqustata alla SS. Republica di Venetia. Dall eccellenza del sig. Cau: proc: Girolamo Corner/Generale De Dalmatia et Albania etc: Dedicata/ All’ Illustrissimo Sig: Catarino Primogenita Suo..
Map maker : CORONELLI, V. . Size : 14.5 x 21.0 inches. / 36.8 x 53.3 cm. Description :Vincenzo Coronelli was both cleric and encyclopedist, with a particular interest in geography and cartography. He joined the Franciscan Order in Venice in 1665 and six years later entered the convent of Santa Maria Gloriosa dei Frari, which was to become his professional workshop. He was sole author or contributor to over one hundred and forty titles and produced several hundred maps, either printed separately or as parts of atlases. 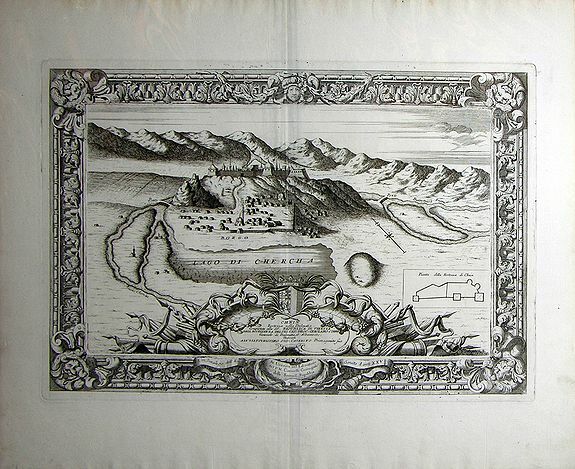 Coronelli published his groundbreaking cartographic work in a number of notable publications, including the Atlante Veneto (1691-1692), the Corso Geografico Universale (1692 & 1695) and the Isolario (1696-1697). As Royal Cartographer to King Louis XIV, Coronelli gained special access to the most current records on world geography sent in from the colonies, and provided by the French Academy of Sciences. Thus, many of his maps contain an unusually large number of legends, commenting upon the most important explorations and discoveries. After he completed his service for Louis XIV, Coronelli returned to Venice in 1684 and founded the "Accademia Cosmografica degli Argonauti," a geographical society with membership drawn from the aristocracy and church hierarchy, and a year later he was appointed Cosmographer to the Republic of Venice. By the end of the seventeenth century, he was perhaps the most famous map publisher in Europe and received constant requests from his contemporaries for information that would enable them to bring their atlases up to date. Shortly after his death, however, his name and work were quickly forgotten, and he remained in obscurity for several centuries. The lasting influence of his work is undeniable, however, and modern appreciation has more than compensated for the earlier lack of recognition. Condition : Slight discoloration on top and bottom margin and ink spots around image.